Billionaire Alisher Usmanov says he will not sell his Arsenal shares after fellow shareholder Stan Kroenke triggered a mandatory buyout offer. Earlier this week Kroenke upped his stake in the club to nearly 63%, obliging him to make a cash offer for the remaining shares. 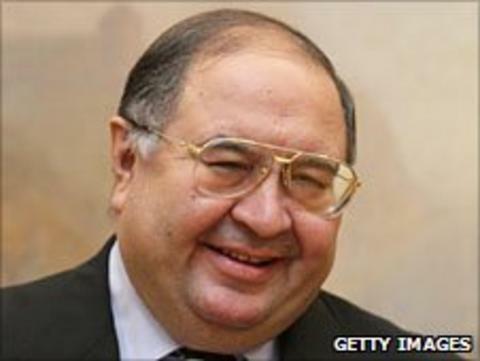 But Usmanov, who controls 27% of the club's holding company, told Bloomberg: "I'm not going to sell my stake. "I love Arsenal, that's why I'm a shareholder." A spokesperson for the Arsenal Supporters' Trust (AST) welcomed Usmanov's stance. "AST welcomes Red and White Holdings' [Usmanov's investment company] commitment to Arsenal and calls on all shareholders to work together," the supporters trust said in a statement. "Their priorities should firstly be making Arsenal a successful football team, secondly placing no leveraged debt on the club or taking dividends and management fees out of the club, and thirdly helping supporters be directly involved in the club's shareholding." American businessman Kroenke became the club's majority shareholder this week when he agreed a deal to buy the stakes of Danny Fiszman (16.1%) and Lady Nina Bracewell-Smith (15.9%) for a fee of around £234m. This took Kroenke's holding up to 62.89%. By passing 30%, Kroenke is obliged to make a cash offer for the remaining capital at a price of £11,750 per share, which values the club at £731m. When news broke that Kroenke had become the majority shareholder, BBC business reporter Robert Peston reported that he had been told Usmanov was "hopping mad" and felt he had been "stitched up" by Arsenal. Russian billionaire Usmanov bought into Arsenal in August 2007, when he paid former vice-chairman David Dein about £75m for his 14.65% stake. In December 2009, Usmanov raised his stake to just over 26%. Kroenke, who owns the Denver Nuggets basketball franchise, the Colorado Avalanche ice hockey team, American football team the St Louis Rams and Major League Soccer side Colorado Rapids, also bought into the club in 2007 and since then has gradually increased his holding. The supporters trust has already indicated it will not sell its shares, saying: "Arsenal is too important to be owned by any one man."